Antique - Duchess China Pattern E&BL 2237, Made by Edwards & Brown of Longton, England. Produced in the 1910 to 1933 period. A (40) Piece Set, Service for Twelve. This Beautiful Duchess China Pattern #2237 appears to be Hand Embossed. A Lovely White China, with Cobalt Band, with outside Rim surrounding Swag made of Green and Pink Flowers; Inner and Outer 22kt Gold Verge, Rims and Feet. 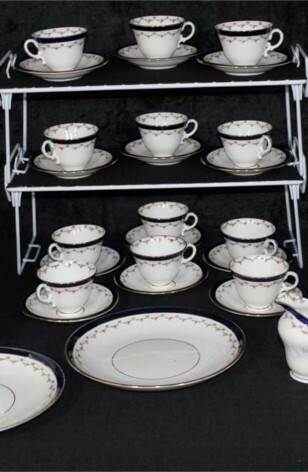 12 - Bread/Dessert/Tea Plates - 7"